Thank you for playing, Konrad2! (EDIT) If I set terrain defense of buildings to 0%, the problem seems to be solved... I am not sure why it works, though. Major updates may not be applied to 1.12.x versions anymore because I will begin porting of this campaign to 1.14 which will require vast rewrite of the whole campaign (ex. discarding obsolete features, troop image must be prepared by object instead of the buggy way). first of all I’d like to thank you for this amazing campaign (and for AG too). It is really fun even though it’s a little difficult to get into it (at least compared to AG). Now keep in mind that I absolutely love this campaign (I finished it 2 times now tried 12 times on hard) because I’m going to point out some things I disliked. Since this is a long list i separated it into small segments. 1.2. meele dmg splitting. If noticed that the leader seems to take less damage than other vanguard units (I’m looking at a vanguard only squad). I’m not sure if this is intentional or if I was just unlucky 10 times in a row. I also notice that units can tank more dmg than they have hp. I assume this is due to the randomly splitted dmg. 1.3. A little bit annoying is that there is no dmg overlap through vanguard/riders. I’m sure this is intentionally but fighting a ranged platoon with 1 meele and the rest ranged with and all vanguard platoon is just stupid. This leads to the problem that meele units are a lot weaker than ranged units. (Still I don’t know if this was intended or not). This is especially annoying with riders since you can’t snipe an enemie ranged boss as soon as the enemy has one rider. This seems kind of absurd if you run a rider company into a squad of ranged units with one rider. It might be useful to transform some of the dmg to the back lines if the frontline died in the battle. 2.1. The geographer on heavens peek: Rumor says there used to BE an…. 2.6. In later Turns (also on Hard didn’t see that problem on easy/medium) during the enemy movement I was affected by a complete fog of war (I couldn’t see my own units). 3.1. Skirmish maps are a little too big. I guess they are randomly created but the size usually wastes 5 turns and forces you to fight at night. I’m not really a fan of that since as the commander I definitely should be able to face the scorpions at day time. 3.2. Might be hard to implement: show the time it takes to watchtower to build (this might work through the hp of the tower. 5 hp is still a one-hit kill for every possible platoon). 3.3. Set the troop spawn out of the antechamber to 58,35 so your units can heal immediately. (I kept a crap leader in the base just so the “real” platoons could spawn on the house). 3.4. Building bridges with to engineer teams (well not that important but still nice). 3.5. If a spy is detected in an allied country lower the intimacy. 3.6. Give options to raise the intimacy (I found that the kalifates never liked me especially in hard). 3.7. A way to hinder enemy retreat. That would give you the option to block units into the mountain passages on the north and south gate and therefore block money of the empire/kingdom. 3.8. If you noticed that I play AG I still get the warning that I should play AG first (also no big deal just something I noticed). 3.9. An option to merge platoons together would be nice. Maybe to send units into a castle would be an option. 3.10. Stopping bandits from spawning if you hold a 4 or more men Platoon at the Fling Forest castle. Same for the mysterious desert. 3.11. A Small heal on castles/village even if the enemies are close by (This would help you to defend the gates). 3.12. It would be fun if the Alcoholics would get a buff on their race terrain (or could walk faster through the forest/walk onto the mountains). 3.13. Also not sure if you can change the AI but: The Ai focuses Paperpushers. My best triy in a hard game was to build few platoons and sacrifice paperpushers on the way. 3.14. I love the landmarks but it would be nice if something happens there (Also the geographers notes are nice but I have no idea how I should use my powers to close the wrath of gaia). 3.15. I don’t know too much about the spy mechanic regarding to when he alerts you that the empire has send money to someone but on easy you get the alert and in most cases nothing happens. 3.16. The Option to build your own castles. 4.2. Reduce the amount of Scorpions. I had on go where I leveled up a mage. Even though this would not be unusual I guess but it was one of the 999 exp. mages. 4.3. If I’m not mistaken the enemies get more gold on hard and you get less gold. I might be just bad but I recommend to just keep one of those options. Since you are massively flooded from all sites. So thats all for now. Thanks again for this awesome campaign and keep in mind that all things mentioned here don't spoil the campaign to mutch. So feel free to ignore them. Also i'm looking forward to treasure hunting. Oh.. thank you for detailed feedback and suggestions. I will fix issues and game balance (especially in hard). Some of them seem to be difficult to fix, though. You are right and I also know them. The former is not disadvantageous to players and it doesn't happen frequently. (And, the fix is a bit tedious ) So I intentionally let it be. The latter may be a bug but nothing serious for usual gameplay. I don't plan any fixes about it at least for now. EDIT: 2.2 is turned out to be easy. I will try to fix it. 1.3: vast damage system redesign might be required to allow damage penetration.... I will consider it during porting to 1.14. Tentatively, attack damage of shooter only troop is reduced significantly. 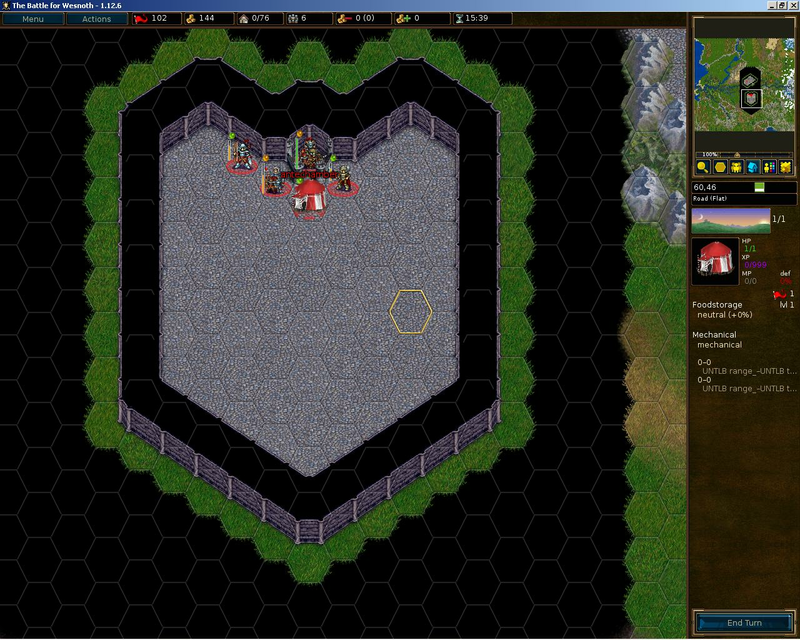 2.5: attacking troops must appear around the leader of their side. In case of goblins, attacking troops must appear near dwarves. (This means they are not so much useful when attacking drakes.) I suppose they try to defense against drakes or Empire because defense is higher priority issue than attacking. 2.6: I saw it several times, too. But I have no idea why it happens. 2.7: I modified the defense of Engineers, Paperpushers, and Flags. 3.2: I added turn number when the construction completed (as above). It is not easy task as you expected. But not terribly hard. 3.4, 3.16: modifying terrains need somewhat long codes... I will try when porting to 1.14. 3.5: spy's identity might not be revealed easily. i think we don't need to change intimacy. 3.6: sending money can increase intimacy. But you don't need to care it seriously. Now scorpions do not appear so much and the intimacy with Khalifate does not decrease rapidly. 3.7: this is further advanced option. Honestly it is too difficult for me! 3.8: Definitely you are right. I've never thought about this. Thx. 3.9: sounds interesting and technically not difficult. But difficult to make good user interface... especially if there are so many other troops around. 3.10: I added some fixes in this version. Fling bandits no longer appear after the assassination event. Scorpions and orcish raid (in addition to Fling one) do not appear in visible area. This will reduce spawning significantly. Agents never care visible area as before. 3.11: tentatively implemented (+2); it may make enemy leaders tougher. So I might revert this change in later versions. 3.12: Their soldiers are humans. So I think their movement type should be same as others. 3.13: It is intentional. (honestly, I don't expect to be pointed out.) I added that point in the manual. 3.14: ... I will implement treasure hunting and give some roles to those places. 4.1: instead, income is increased in hard level (significantly) and activation of Empire is delayed. I guess it will give you a time to preparing for their attacks. 4.2: they no longer appear in visible area. So its frequency must be decreased. 4.3: Exactly. It must be too hard. In the new version, your income is the same as normal difficulty. I was splitting squads and for whatever reason, this tent became appeared in the antechamber. Also, I have 3 Engineers, but when I click next to any of them to build/destroy a building, the first one recruited reacts. That is, the first one of them speaks, and if any building is being built, the first one has no move. Also, I can not build/destroy, while a building is being built, because the first engineer says that they are already building something. I couldn't find the reason for the first bug... It is completely unexpected and I cannot understand what to be fixed. Please report me if you met this one again. The fixed version, 0.2.7, was uploaded to addon server. Thanks, Rovik! I have fixed the bug and uploaded 0.3.0beta2 to the addon server. # the invisible foodstorage is in your recall list (not accessible, though) due to my silly typo. Hi, I just re-downloaded this add-on (0.3.0beta3) for 1.14 (a fresh compile of the 1.14 branch from today). Trying hard this time (I finished an earlier version on medium), I used the offered "little bonus" option because I finished "A Group in a War" previously. When trying to show the status of my own troop (either in the field or in the antechamber), I just get a Lua error (and nothing else happens). Same when I choose the add/remove members option. Those terrible bugs are fixed (0.3.0beta5). Thx, pauxlo! The same issue for "tough" and "impenetrable" abilities are also fixed. I might have added buggy code recently... Sorry. Thanks for the update. I can confirm that I now can see the status for my own company of two. Unfortunately this seems to have made it worse, now the game is freezing when going back from the castle to the main map. Same happens if I enter a skirmish and retreat and come back to the main map (the only skirmish I had available was with my two-leaders company against the insurgents, so I didn't actually want to fight right now). If I instead load from just before the end of a previous skirmish, and finish that one, it works better. Ah, I thought I just missed the treasure applying to some troop. Thanks for fixing what I didn't even mention. Thank you again and again, pauxlo! That bug is fixed and new version 0.3.0beta7 is uploaded. One tiny thing: A commander of a squad got enough exploit to become a platoon, but the message said "the troop becomes a squad". Another one, which might or might not be intended: Some turns back, I asked the goblins to help me against the trolls. They said "yes", but didn't send any troops. Another quirk: The "show status of this group" doesn't always agree with the "members" count in the side bar. Marreorer Squad (near Fusia) has four members, but only three are shown in the status list (the fourth one is a spearman I just added). And if I want to see the status of enemy leaders, I sometimes get WML errors, too – "attempt to compare string with number" now for the Dunefolk capital.